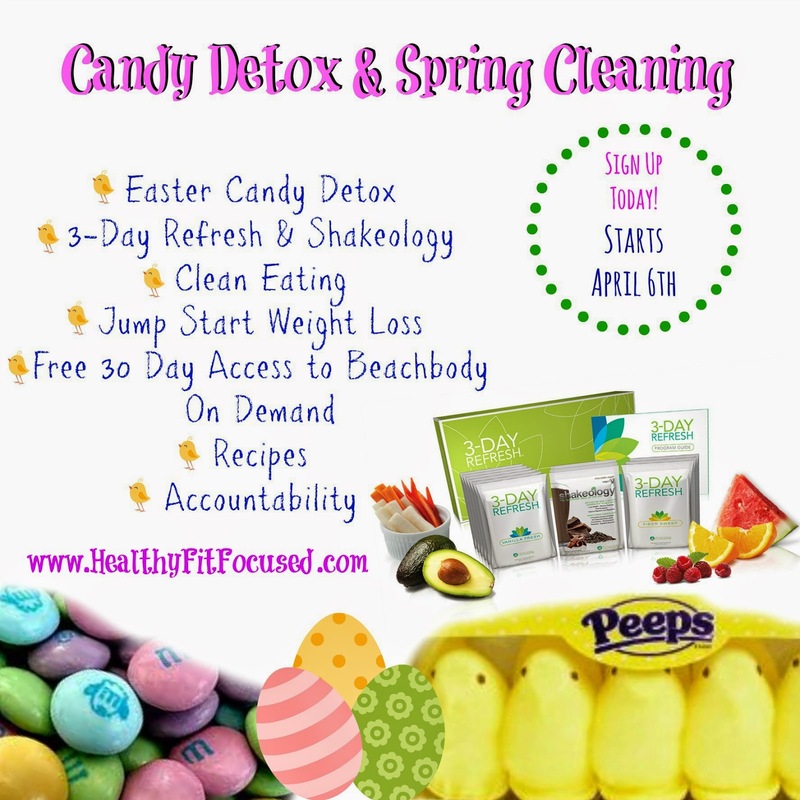 Healthy, Fit, and Focused: It's Time for Spring Cleaning, Candy Detox and 3 Day Refresh! It's Time for Spring Cleaning, Candy Detox and 3 Day Refresh! Spring has sprung...and so has the Easter Candy!! Seriously...there is candy all over the place, it's already EASTER CANDY OVERLOAD!! Every year, there's new colors, flavors and kinds of candy...the madness just doesn't end, does it? Well, I'm here to help some of this craziness stop! No, unfortunately I can't take the Easter candy out of the stores, but we can definitely work together to do some Spring Cleaning and Detoxing from the candy!! I've shared my 3 Day Refresh results with you, and I absolutely love this 3 day program. It helps keep me on track...it gets my mind refocused and my body prepped for best results of my workouts and nutrition! Then from there we will head straight into learning how to keep your success of the 3 Day Refresh and start clean eating and drinking Shakeology every day for 30 days! The awesome part is that the 3 Day Refresh and Shakeology Pack is ON SALE this month...AND, better yet, it comes with a FREE 30 DAY TRIAL OF BEACHBODY ON DEMAND!!! So that means for the length of our group you can workout to your choice of 11 Beachbody Fitness programs right from your laptop, iPad, phone, computer, any mobile device! !